Thunderstruck 2 Slots Machine - Is it as Good as They Say? 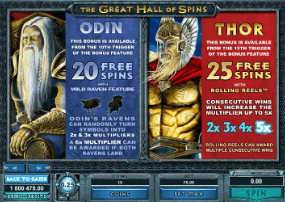 Thunderstruck 2 Slots Machine – Is it as Good as They Say? You’ll be Thunderstruck as soon as you start playing this online casino slot game from Microgaming. Thunderstruck 2 slots machine manages to provide you with even more features, better graphics and plenty of other reasons why you should play it. The first version of Thunderstruck had a major success and it made perfect sense for Microgaming to launch the second version. This is by far one of the most popular slot machines online and there are many great features that you should take into consideration. The graphics of this video slot games can be considered to be epic. However one of the key and innovative feature is called the “Wild Storm”. Thor’s lightning is going to strike your reels and turn them into wilds. This can happen to up to 5 reels. Unfortunately there is no progressive jackpot available at this video slot game, however there are many special features that will provide you with a continuous flux of casino chips going into your pockets. With 96% payout it’s not one of the loosest Microgaming slots, but you still have the chance to win up to 2.4 million coins. The most interesting and captivating feature from this online video slot game is the free spins rounds. As soon as you start spinning the reels you will get the nice opportunity to trigger the Great Hall of Spins. That’s where you have the opportunity to launch the four free spins rounds that are available. Their names are: Valkyrie, Loki, Odin and Thor. Each of them has a different number of free spins attached and it all starts from 10 up to 25 free spins. 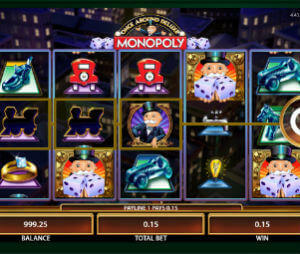 The multipliers attached to these free spins bonus rounds go up to 5x and each of them has a different feature attached. As you trigger this feature you get the chance to advance to the new level and after you trigger them all, you can choose which feature you want to play. 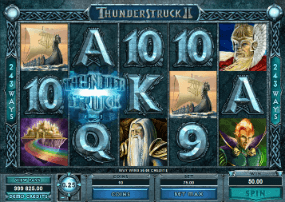 The Thunderstruck 2 is an online slot machine with a medium variance. This means that it’s always going to prove to pay you well and it can be considered to be a well-balanced slot machine, from which from time to time you can get to see some huge pays.